Been a rough spring so the forecast of back to back 70 degree days in West Central Illinois had me cashing in a vacation day for Friday the 13th to hit some public access Knox County, IL strip mines. I’d originally attempted this plan with vacation days on April 2 and 3 but nasty weather had me opting to go to work instead and wait for better conditions. Turned out to be a good decision. 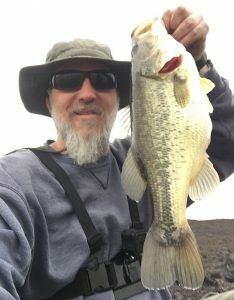 Angler Comments: Nice setup with a small pocket featuring a shelf that dropped into the main lake basin and was just getting pounded by a heavy south wind. 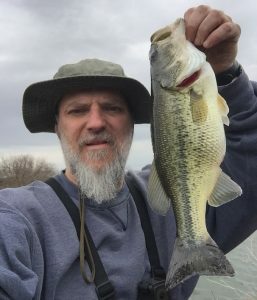 Casting from the bank into the teeth of the wind produced this bass and another a 1-0 within a three minute span on the lipless crank right at the dropoff. Angler Comments: Caught a 2-1 on April 8, 2017 from this same exact location and was pretty sure I could repeat the feat. The narrow chute on the north edge of this spot was getting a direct hit from the gale force winds. 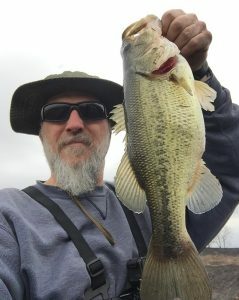 The second of two bass in the first two minutes of casting to the spot (first was 11.5”). Fun stuff and can make you feel smart but this was a no-brainer, would’ve bet money on this one. Angler Comments: Between the main lake and a southern finger on this spot is a shallow ridge that drops on each side into deeper water. Sounds like a broken record, but I’m no dummy and play the wind for every bite I can find when bank bound. Another bass right where it should be, on the windblown drop in this case, one of six that the specific area would produce and a cool page out of the Bass Fishing 101 textbook. 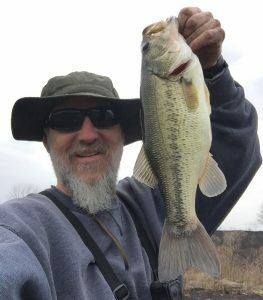 Angler Comments: This area has produced in the past from a different bank bound angle and I was fortunate that conditions allowed me to get at it from the other direction thanks to a controlled burn knocking out the nasty terrestrial vegetation. Honestly, still not sure what holds the bass but it produces. So, while still curious, I suppose that ultimately it is irrelevant and I’ll just keep casting away each visit.